How one of Michigan's best players nearly lost his leg playing football and found a role as an assistant coach. The sudden goodbye of one of college football's best players. Tua mania in Tuscaloosa. And Week 8's must-watch games. Adam Kramer explores what's happening in college football in his weekly college football notebook, the Thursday Tailgate. When Grant Newsome suits up against rival Michigan State this Saturday, the former Michigan offensive lineman will do so as the assistant tight ends coach for the Wolverines. It's a role he is growing into on a team that is suddenly very much in the College Football Playoff discussion. Two years ago, the 21-year-old was one of the Big Ten's most promising linemen. But on Oct. 1, 2016, Newsome suffered an injury that would change his life. Early in the second quarter against Wisconsin—the team Michigan conquered with ease this past Saturday—a defensive player hit Newsome's right knee low and awkwardly while his foot was planted in the ground. Refusing to be carted off, Newsome limped to the locker room before he was taken by ambulance to the hospital. As his knee swelled up, Newsome contemplated how long he would be out. With Michigan's bye week approaching, he thought he may only miss one game. Within hours after being admitted to the hospital, however, Newsome learned the severity of his injury. He dislocated his knee and shredded the artery that provides blood flow to the lower leg. Minutes after Michigan's game, which he watched on television from his hospital bed, Newsome was rushed into emergency surgery. "I remember asking my doctor if I was going to have a leg when I got out of surgery," Newsome says. "And he told me they were going to try their best. Of everything that happened that day, that's probably what I remember most." Newsome spent the next 38 days in the hospital, including 10 in the intensive care unit. He underwent six surgeries. Last fall, he underwent a seventh. It has been nearly two years since Newsome's right leg was saved, something his doctor told him might not have been possible had they waited 15 or 30 minutes longer. Even after the surgeries, there was concern he might walk with a cane for the rest of his life. Knowing the odds were stacked against him, Newsome attempted a comeback. He did physical therapy seven days per week. After eight months, he was running in a straight line. The goal was to see the field. And up until this summer, Newsome felt as though he was on track to do so. But on Aug. 20, after consulting with a number of doctors, Newsome announced his retirement on Twitter shortly after he delivered the news to head coach Jim Harbaugh. "I started to think about my broader future outside of football and whether I should risk a relatively healthy and normal life," Newsome says. "And I was real with myself. If I wasn't going to be able to be the player I was before, was it worth taking these risks?" 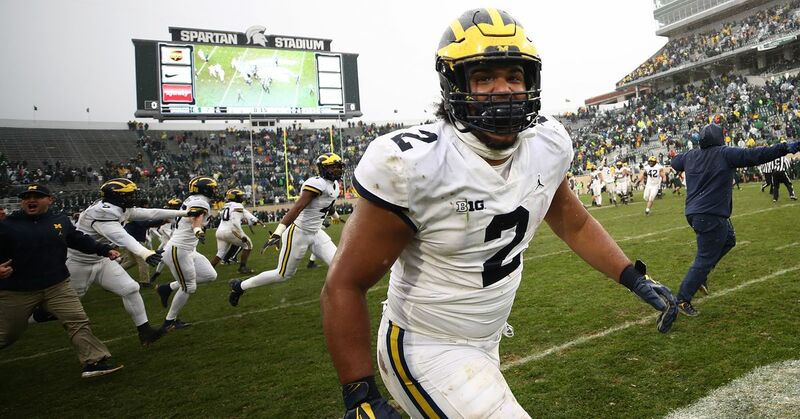 Newsome made the difficult decision to end his comeback after nearly two years of trying, but he didn't drop Michigan football entirely. "Football is like a drug," he says about becoming an assistant coach. "It's really hard to quit. And this was kind of a way for me to kind of ease my way off of it and still be around the guys who I've become friends with and all the coaches." While it has taken some getting used to, Newsome is embracing his new role for a team that suddenly controls its playoff destiny after a Week 1 loss to Notre Dame. His focus has transitioned from creating running lanes and protecting his quarterback to game-planning and scouting. He still rehabs his right leg three days per week—a process that will likely be a part of his daily routine, at least in some capacity, for the rest of his life. And while he learns the nuances of coaching, Newsome is also working on his master's degree in public policy. In July, he received his degree in American culture, with a minor in African American studies. Whether football is a part of his life after Michigan is yet to be determined. He's also considering getting into public policy or starting his own nonprofit organization to benefit those in need. But for now, his focus is Michigan State. And for the foreseeable future, he will play a far different but still impactful role in the Wolverines' success. "I've loved it so far," Newsome says of coaching. "It has some challenges, but it's also rewarding in different ways than playing. Fortunately, I still have over a year to figure out what I want to do with my life." Nick Bosa, the star Ohio State defensive end who NFL draft connoisseurs are projecting as a potential top overall pick in next year's selection pageant, is done with college football. After suffering an abdominal injury earlier this season, it was unknown when or if he might appear again. Ohio State confirmed Tuesday that Bosa has withdrawn from school to focus on his health and turn his attention toward his professional career. He will soon be paid handsomely to play football. "I was hopeful that Nick would be able to return to play again for us," Ohio State head coach Urban Meyer said in a statement. "I know this was an extremely difficult and emotional decision for Nick and his family, and I wish him well as he moves on to get himself 100 percent healthy and ready for his next chapter." There's a weight to this. One of the most talented players in the country is walking away from an undefeated team, a College Football Playoff hopeful, to focus on his health and imminent fortune. Good on him for doing so. Sure, it's a loss for everyone else. But this a business decision, one which most can hopefully understand. He isn't quitting on his teammates or his program. He isn't turning his back on the sport. He is doing what any intelligent human blessed with remarkable physical attributes would do in the same position. I don't doubt this was a difficult decision for Bosa and his family, but it's the right call. Enjoy the fortune, and good luck in the NFL. — There was a bizarre uneasiness at the end of the first quarter with Alabama up a mere 13-10. Tua Tagovailoa threw for nearly 150 yards and one touchdown in the first 15 minutes, yet there was a nervous energy before the Tide blew the game wide-open. That apprehension became even more pronounced when the home crowd waited for Tua to emerge from the injury tent after he tweaked his knee. These are strange, exciting times in Alabama, but expectations are reaching a point of absurdity. No. 3 Clemson vs. No. 16 NC State (Saturday, 3:30 p.m.): NC State feels like one of the few opponents remaining on Clemson's schedule with a legitimate chance to upend the Tigers. That speaks volumes about a) the Tigers' schedule, b) the ACC as a whole and c) the fact that the Wolfpack might be the best team no one is talking about. No. 12 Oregon vs. No. 25 Washington State (Saturday, 7:30 p.m.): The atmosphere will be a mix of Fireball and optimism, which could be the perfect Saturday upset concoction. That's a more elaborate way of saying that one week removed from upsetting its biggest Pac-12 rival, Oregon could have its hands full. No. 6 Michigan vs. No. 24 Michigan State (Saturday, noon): The rivalry is always salty and the hate is real, no matter the records. But after last weekend, there are meaningful football implications that make it that much sweeter. Michigan looks like a potential playoff team, and Sparty would love nothing more than to destroy that. No. 15 Washington vs. Colorado (Saturday, 3:30 p.m.): This would have been far more interesting and easier to write had both teams not lost last Saturday, but the show must go on. In fact, there is something intoxicating about two desperate football teams forced to play each other. That is precisely what we have here. Of course, it isn't just Purdue in prime time (Saturday, 7:30 p.m.), but also Ohio State coming off a sluggish Saturday despite another potent performance from quarterback Dwayne Haskins. If this is your first serving of Purdue in a while, you're in for a treat. The Boilermakers have the nation's No. 10 total offense and should find space against an Ohio State defense that has not exactly been a brick wall. The Buckeyes counter with the No. 2 overall offense, so the end result could be a fabulous game that pushes up near 100 combined points. What does this mean? It means Bowling Green is the first to get a crack at the coaching search. Bigger picture, however, it's a reminder of the turbulent times ahead for many. These late-season games will start to mean a lot more for certain coaches than they do for others. This is the scene from Ames, Iowa, last Saturday. It featured a Top 10 team falling, along with the greatest halftime show of the season. The hope is that other marching bands will catch on. In fact, dinosaurs shouldn't just be an option in halftime routines. They should be mandatory. That 3-7 start over the first two weeks of the season feels like it happened a lifetime ago. Since then, we're a blistering 18-11-1. If that pace holds, we should have enough money to buy your loved one that pony they've wanted for the holidays. Congratulations in advance. Operation: ACQUIRE HOLIDAY PONY continues in Week 8. Here are the picks, using lines provided by OddsShark. Temple (-3) vs. Cincinnati: The Bearcats are undefeated and…getting points? Do not fall for the trap, friends. Washington State (-3) vs. Oregon: Yep. Mike Leach gets it done. It won't be easy or fun to wager on, but it's going to happen. Duke (-7) vs. Virginia: Your classic Virginia-beats-Miami-and-then-loses-to-Duke-by-14-points letdown spot. Auburn (-3.5) vs. Ole Miss: Sure, Auburn's football program is currently in disarray. But that seems like the ideal time to buy as low as we possibly can. Mississippi State (+6.5) vs. LSU: The perfect letdown spot for players, coaches and fans. Fascinating spread given last weekend's results.